In what is becoming a theme, Packers’ Tyler Lancaster made a significant impact in run defense with three stops on the day. While he’s still far better in run defense, he did have a couple pressures on the quarterback this week, too. It was a rough day for the Packers’ pass defense. Jaire Alexander, who has cooled off the last few weeks after an impressive start to the season, allowed a few first downs before leaving the game due to injury. Josh Jones and Tony Brown gave up a few big plays of their own. Jamaal Williams filled in for the injured Aaron Jones nicely, picking multiple long gains and making an impact catching passes out of the backfield. Aaron Rodgers stepped up big in this one, as he rushed for two scores and a two-point conversion in regulation and earned the win on a throw to Davante Adams in the end zone. Sam Darnold has been playing very well the past three weeks since returning from injury. He completed 75% of his targeted passes, set a season-high 341 passing yards and threw for three touchdowns with no interceptions for the first time. Robby Anderson was Darnold’s go-to receiver against Green Bay, and he really stepped up. He caught nine passes on 12 targets for 140 yards–all season highs–along with one touchdown for his sixth of the season. Avery Williamson turned in a solid performance against Green Bay, but there weren’t too many other bright spots for the Jets’ defense on the day. Leonard Williams flashed in run defense, but his inability to affect the passing game as a pass-rusher is still an Achilles heel for the former first-rounder. Rodgers and Adams finished the contest with the bang, but Williams’ consistency on the ground and in the passing game was also crucial to getting Green Bay in a position to win. 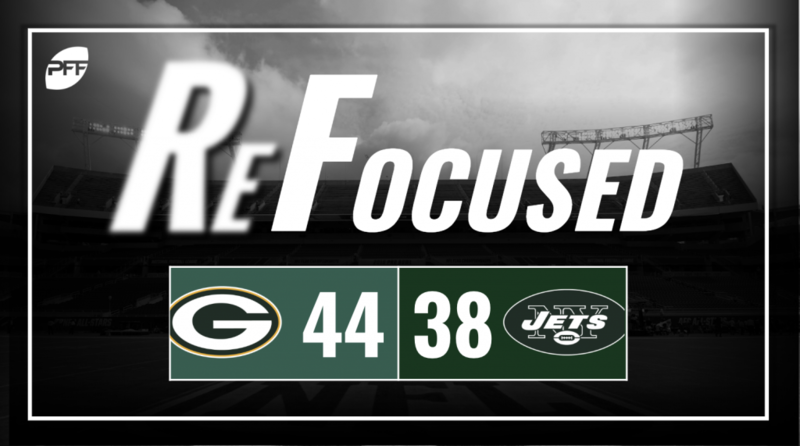 The Jets put forth one of the best offensive performances of the season, but it didn’t quite turn out to be enough with the defense struggling to make stops in the second half.